The dramatic hormonal shift of menopause is a natural life-phase accompanied by frustrating and uncomfortable symptoms. There are many effective, pro-active health strategies to help minimize the hot flashes, night sweats, fatigue, discomfort and stress of menopause. Take Futurebiotics EstroComfort and a comprehensive multi-vitamin and eat a nutritious, well-balanced diet that includes fruits, vegetables, whole grains, low-fat dairy and lean protein. Soy and other sources of isoflavones may help reduce the symptoms of menopause. Eliminate caffeine, alcohol and hot spicy foods, which can all trigger hot flashes. Exercise is a great way to fight fatigue and stress. Plus, bones can become brittle after menopause. Add at least 30 minutes of weight-bearing exercises daily such as walking, jogging, tennis or dancing to help preserve bone mass. Stay well hydrated while exercising. Keep cool. Slight increases in your body's core temperature can trigger hot flashes. Dress in layers so you can remove clothing when you feel too warm. Stress can increase the symptoms of menopause. Visualization and muscle relaxation are simple and effective ways to reduce stress during the day. Try a massage or yoga for relaxation. Studies have shown that slow, controlled deep rhythmic breathing - known as paced respiration - practiced twice daily decreases hot flashes. It can also help provide relief if practiced at the onset of a hot flash. If you feel a hot flash coming on, try sipping a cold drink. Keep a cold drink by the bed at night. Pay attention to whether certain foods or drinks increase your menopause symptoms and limit your intake of those foods as needed. Cigarette smoking is linked to increased hot flashes. Meet with your healthcare professional and discuss healthy ways to manage menopausal symptoms. Over time, re-evaluate your symptoms and treatments and adjust as necessary. Menopause occurs when the ovaries gradually lose their ability to produce the hormones that govern menstrual cycles. These decreased levels of hormones can trigger a variety of uncomfortable symptoms. 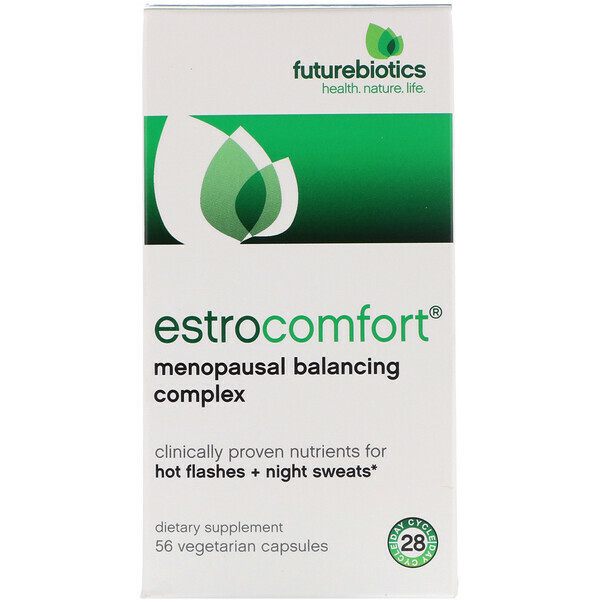 EstroComfort is an all-natural phytoestrogen supplement fortified with L-Theanine designed to offer a nutritional alternative and help reduce menopausal symptoms, including hot flashes and night sweats. SoyLife 40% is a soy germ extract, standardized to contain 40% isoflavones. It is produced from specially selected whole soy germ; unlike some soy isoflavones that are extracted from hexane-derived soy molasses. It contains the preferred isoflavone profile of 15:50:35 for the active constituents genistein: daidzein: glycitein. SoyLife has been clinically studied and shown to help reduce hot flashes and night sweats. Black Cohosh extract, standardized to contain 2.5% triterpene glycosides as 27-deoxyactein, has been used in Europe for many years and helps treat the symptoms associated with menopause, including hot flashes, night sweats, nervousness and irritability. L-Theanine is a non-protein amino acid that research suggests may induce relaxation and relieve emotional stress without drowsiness. 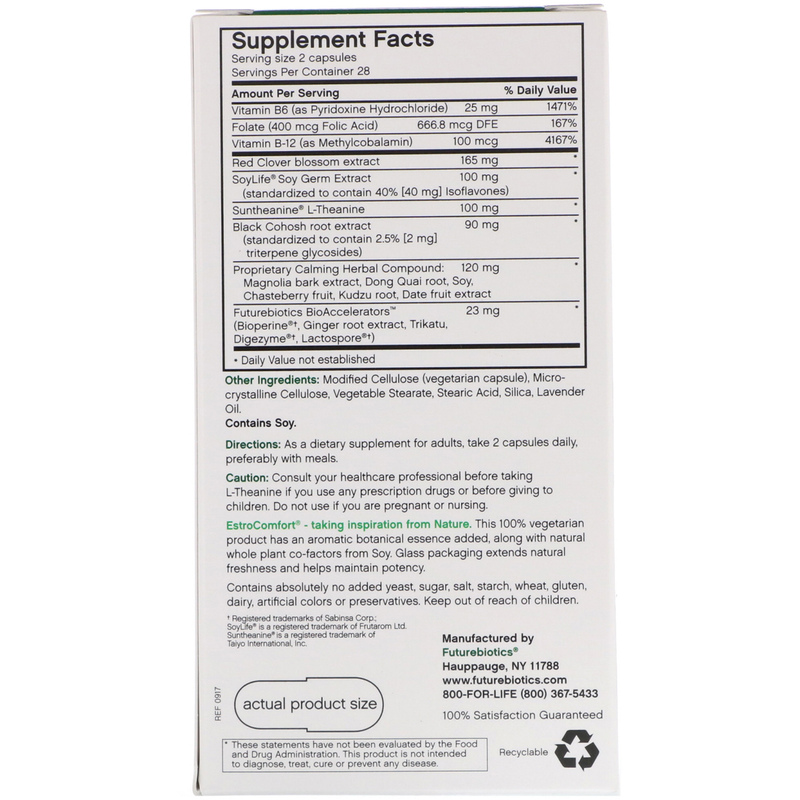 EstroComfort is further enhanced with cardioprotective essential B vitamins and a calming herb compound of Magnolia bark and Date fruit extracts. In addition, whole unextracted Soy provides all the natural co-factors that nature created. 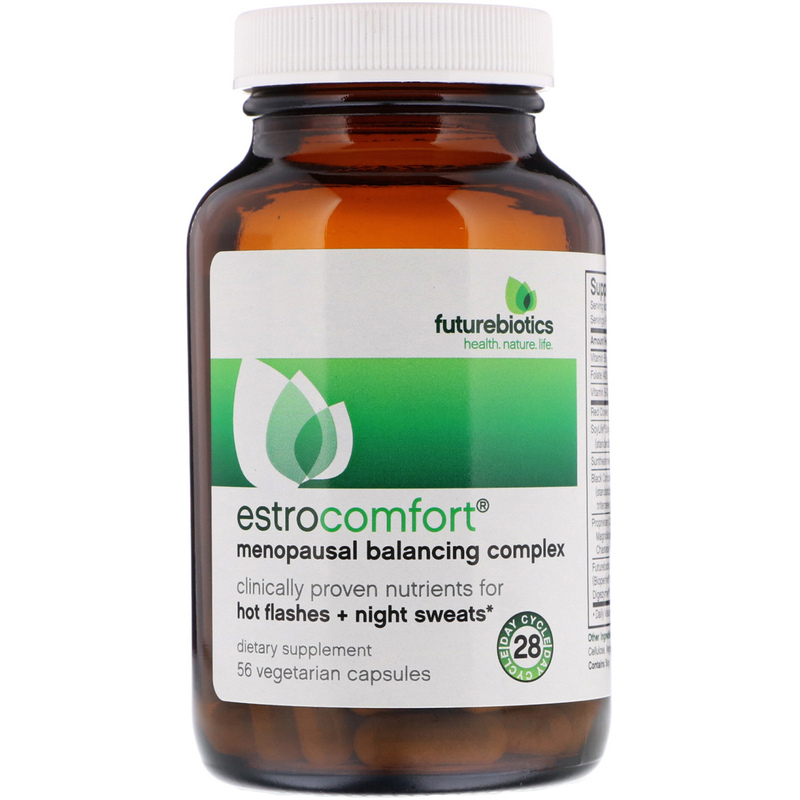 EstroComfort is potency-enhanced with Futurebiotics BioAccelerators. Clinically-proven Bioperine (piper nigrum extract) improves nutrient bioavailability, while our proprietary natural compound of Ginger extract, Trikatu, super-potent Digezyme and Lactospore boosts digestion and absorption. Menopausal symptoms, including hot flashes, could be significantly decreased with 84 mg of daily soy isoflavones and were statistically comparable to women who received HRT. Modified cellulose, (vegetarian capsule), microcrystalline cellulose, vegetable stearate, stearic acid, silica, lavender oil. EstroComfort - taking inspiration from nature. This 100% vegetarian product has an aromatic botanical essence added, along with natural whole plant from Soy. Glass packaging extends natural freshness and helps maintain potency.